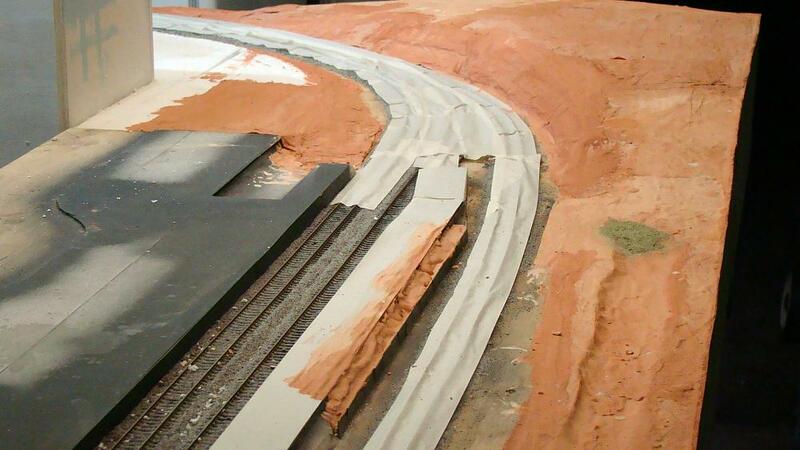 Scenery underway on the front of the layout, with a layer of plaster added to the shaped polystyrene base. The wiring on the last end module has been finished, completing all the mandatory wiring on the scenicked modules. This wiring has also taken into account the addition of future projects as part of the planned evolution of the layout. Attention has since turned to the storage yard, firstly installing the mains circuit breaker, power outlets and wiring, and connecting the two transformers. Next the track power was wired and tested on one yard module, with the next module awaiting completion. The use of Peco electrofrog points has meant additional wiring for each point, however the advantages of providing constant power to all wheels whilst removing any reliance on the point blades to switch track power, far outweigh the extra work required. The control panels for the storage yards have been designed and are currently awaiting assembly, using the same method as described in the June 2009 construction update. View of the plaster base at the Up (Sydney) end of Wallerawang station, where the water tank will be located. Polystyrene foam has been glued and shaped to form on all the modules, and a 3 millimetre (1/8 inch) MDF fascia glued to the station module and it's adjacent end module. 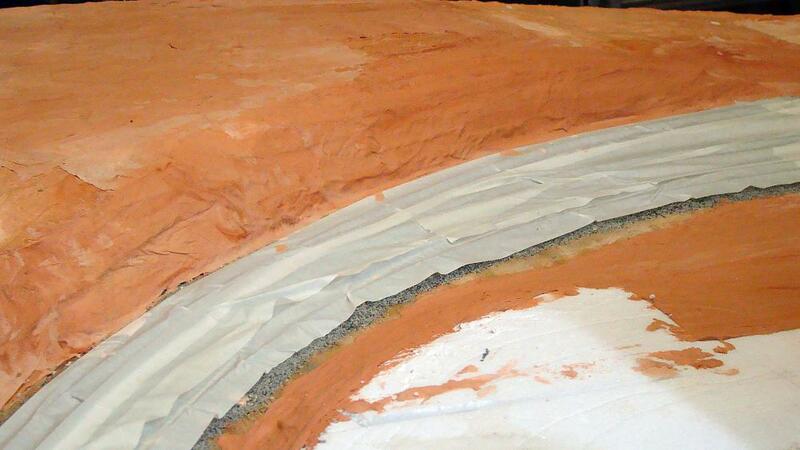 Paper towel soaked in clay coloured plaster was then applied over the shaped foam on these two modules, and worked to the edge of the fascia.